Blyss Pickering is a passionate advocate for nature and protecting the vital relationships between the urban and natural environments that surround us. 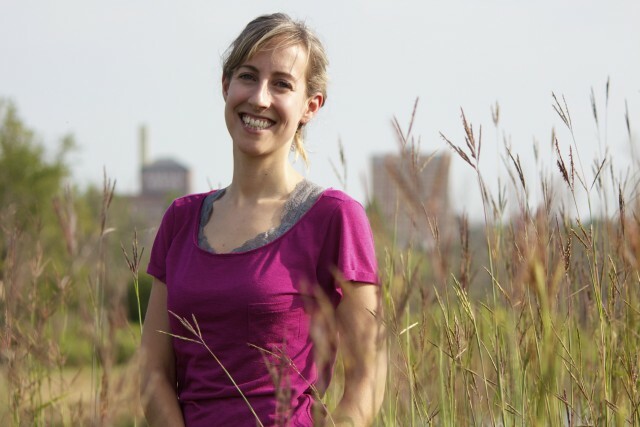 She studies the ecological health of riparian forests around the City of Brandon, and is adding to both the social and scientific knowledge associated with municipal development in these areas. 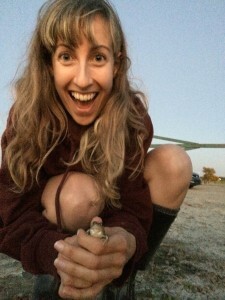 Blyss tries to overcome her fear of frogs by holding one, if only for a moment. She’s also a bit nervous around frogs. “I have always liked frogs, even if I was terrified of them, and it was for completely nonsensical reasons which I can hardly blame frogs for!” laughs Blyss. Despite this, she has dedicated her honours thesis at Brandon University to the study of riparian ecosystems, and the role these areas play in managing the urban/nature balance. Riparian ecology, the study of land and its relationship with a river or stream, is an important consideration in Brandon’s flood-prone landscape. Through her research, Blyss is considering the health of local riparian forests, and the impact recent ecological changes have had on these regions. Through her research in the Brandon area, Blyss has developed a keen interest in how scientific considerations interplay with social dialogue. By actively researching in the city, she has witnessed the interaction of many factors when assessing and striving to understand riparian forests. Blyss’ undergraduate experience actively researching and studying this locally relevant issue has also led her to consider the value of riparian ecosystems, and how this value can, or, in many cases, can’t be quantified. Having graduated in May, Blyss now plans to pursue a Master of Geography in Planning at the University of Saskatchewan with a focus on the social aspects of watershed planning. She is also very interested in the technology used to manage and treat waste water. “The best advice I could give is to get involved with as many things as possible,” said Blyss. Blyss credits her experience at BU with preparing her to confidently pursue graduate studies, or to embark on an interdisciplinary career path that explores the interactions between nature and our urban environments.